The Cast Iron Bath Company Keeps Expanding! Home|Compressor Systems|The Cast Iron Bath Company Keeps Expanding! The Cast Iron Bath Company are the largest supplier of traditional style cast iron baths in Europe and have recently needed to expand their manufacturing operation in Scarborough. 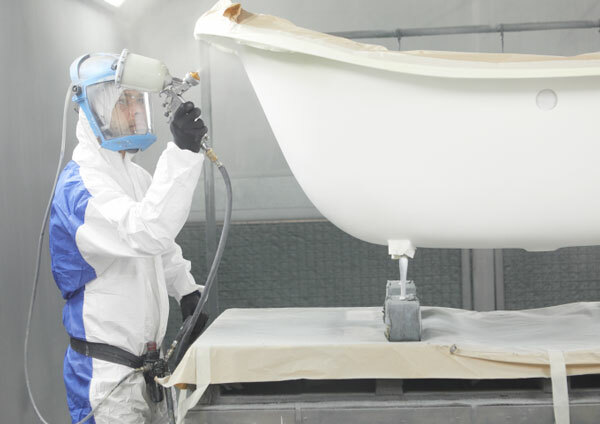 “Our in-house painting department has a very busy schedule to keep, it is critical to have a reliable and responsive partner to ensure that downtime is kept to an absolute minimum. I invited tenders from several companies when we initiated our operations and NC-Air won the contract based on their reputation, price and the quality of their products and service. We made the right choice – in our three years of working with NC-Air they have never let us down. The equipment they provided is incredibly reliable and energy efficient which is perfect for our needs and have recently carried out a large pipework installation across our site with no disruption to our production whatsoever! The whole team at NC-Air are a pleasure to deal with. They are polite, professional and very organised; I do not need to worry about contacting them with regards to our quarterly breathing air tests and on-going service on our equipment as they schedule these on our behalf and give us plenty of notice to co-ordinate site visits, this allows us to schedule the testing with minimal disruption to our work schedule. To find out more about The Cast Iron Bath Company please click here.